Visiting the Acropolis is one of the highlights of your visit to Athens, a must-see site that epitomises Ancient Greece. This rocky hill is topped by the Parthenon temple dedicated to Athena, Goddess of wisdom and war who planted the first olive tree on this very spot to found the city of Athens. On a visit in late February, we experienced warm and sunny weather, making Spring the ideal time to visit the Acropolis before the scorching heat and crowds of summer descend on Athens. 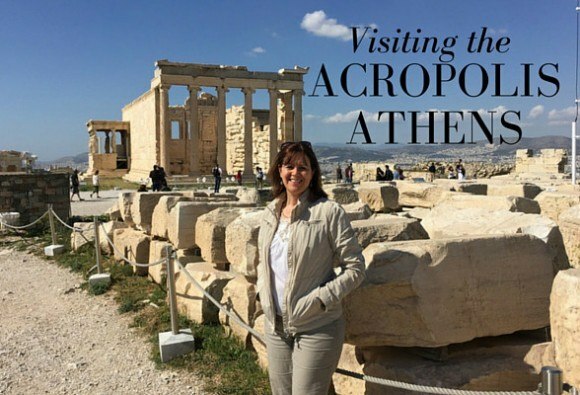 My previous Acropolis visit had been during another trip to Athens for a blogging conference – read about it here. On Saturday afternoon I walked up as I’d done before, hoping to photograph the ancient temples in the golden glow of the late afternoon sun, but was disappointed to find that the site closes early at 3pm in winter. Undaunted, we returned the next day to visit the Acropolis, and climbed up the steep pathway winding up to the top, which my parents who are in their 70s had to navigate quite cautiously since the rock was worn and slippery in places. Although the site is flatter at the top there are many places where the ground is very rocky and uneven, so older visitors will need to take care. Passing through the gateway of the Propylaea at the top of the steps we had our first view of the Parthenon, the iconic temple dedicated to the goddess Athena, after whom the city of Athens was named. Within the temple originally stood a 12 metre high gold and ivory statue of Athena, although it was lost in the Byzantine era and only copies remain. 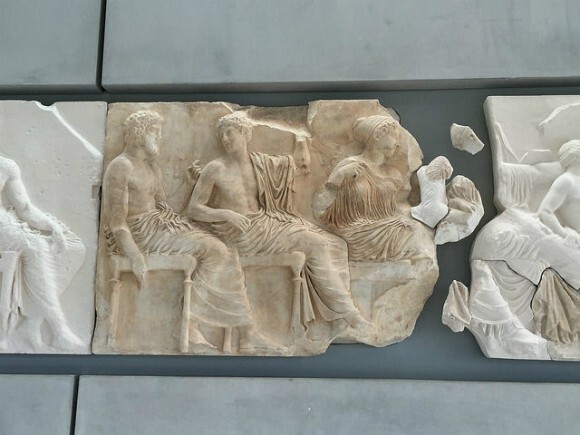 Around the top of the temple runs a frieze of all the gods which now resides in the Acropolis Museum, since most of the original stone carvings have been replaced with copies. 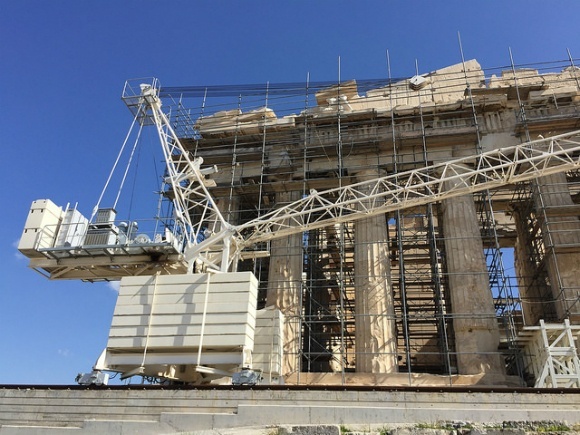 A surprising aspect of the Parthenon is that much of it resembles a building site, dominated by scaffolding and cranes, with a restoration underway that will continue for some years. The temple seemed to have been partly dismantled, with blocks of stone and parts of ancient columns piled up ready to be hoisted into position. In another area near the entrance, some of the carved stones that will replace the frieze could be seen close up, stacked as if in a timber yard. Once we had walked around to the front of the Parthenon, we found a scaffolding free view of the temple. 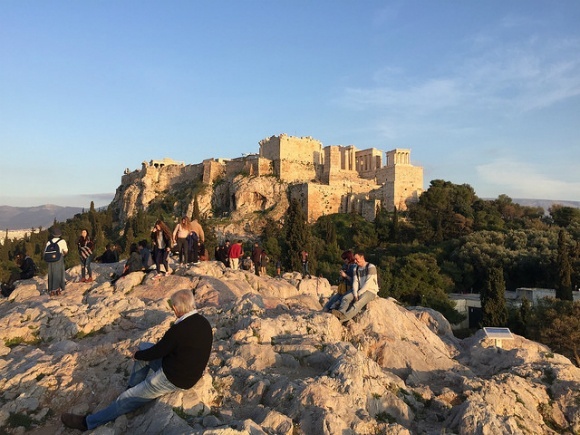 At the furthest point of the rock, a raised area provided plenty of selfie opportunities as well as a view of Athens, sprawling endlessly towards the mountains. 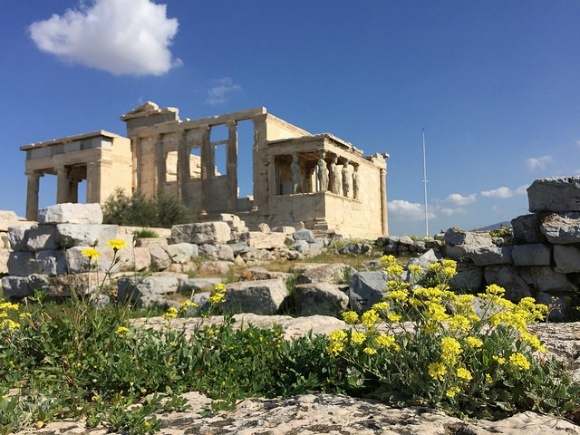 While my parents established themselves to sit a while in the shade, I went to explore the other main monument, the Erechtheion that stands on the northern side of the Acropolis rock. 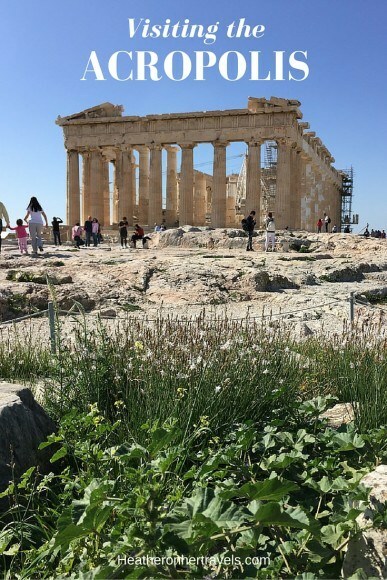 This temple was built on the sacred spot where the goddess Athena is said to have planted the olive tree, the symbol of Athens that brings peace and prosperity. The temple is best known for the Caryatids, the row of maidens in draped tunics that support the roof. 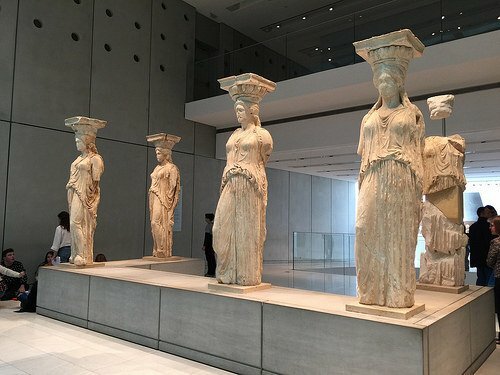 The ones here are copies, since the originals are in the Acropolis Museum, with one in the British Museum (part of the ‘Elgin Marbles’ collection that Greece is campaigning to have returned). Around the site are information signs telling you about each temple and of course if you visit as part of a guided tour, you will get plenty more information. 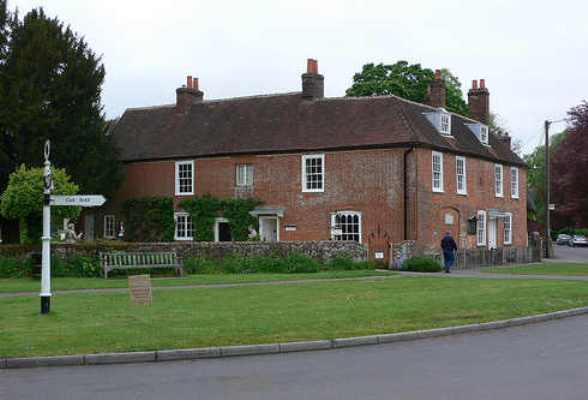 If visiting independently, you can hire a registered guide at the entrance if you wish, or use your guidebook to give you an overview of the site. You can’t get inside any of the ancient buildings so it’s more about taking in the views of the temples and over the city of Athens and wondering at the huge scale of this iconic site. There are toilets at the top of the Acropolis rock but nowhere to buy drinks or refreshments, so you should at least take some water with you. In the hotter months it will be baking up here with only a few places for shade. The entry is €12 per adult, €6 for reduced tickets (aged 65+ from EU if you produce a passport) and this gives entry to a number of other sites for 7 days. In winter (Nov-March) the site opens 8.30-3pm and in summer 8am-7pm. We were there in late February when it was not too crowded but in summer I imagine that the crowds are huge, so you may want to visit early or later in the day when the tour groups have gone home. 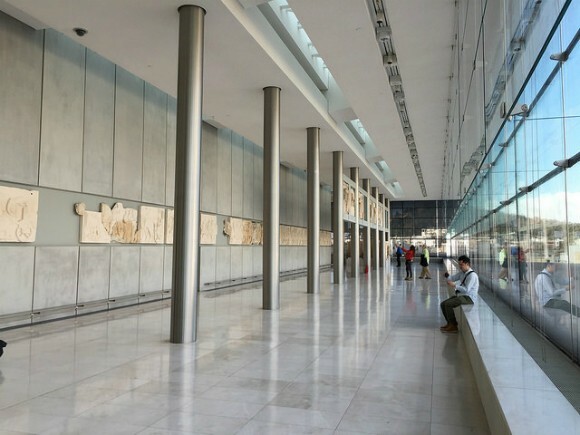 After the Acropolis, our next stop was the Acropolis Museum, a world-class setting for the treasures of the Acropolis hill that rises above it. Most of the statues and friezes on the Parthenon have been brought here to preserve them, being replaced by modern copies on the temple itself. 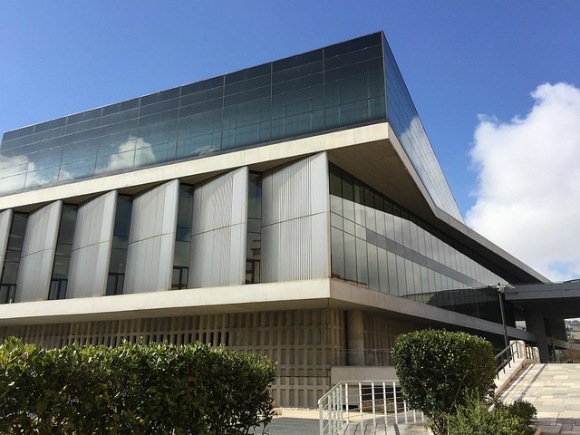 On the outside, the museum shows its clean, modern lines with walls of glass to shed plenty of natural light and give views towards the Acropolis rock. The museum is built over the remains of the ancient city and you can look down into the kitchens and latrines of Ancient Greece as you walk towards the entrance. The open galleries on the first floor are supported by columns and many of the sculptures from different periods of the Acropolis are on display here. Originally many of these would have been painted in bright colours, very different from the serene white marble appearance of today. I was surprised to see how different the statues would have looked, with almost garish blues and reds and details picked out in gold. On the third floor, the Parthenon Gallery is laid out to mimic the Parthenon itself, with steel columns in place of the marble pillars of the Parthenon, and the friezes that ran all around the sides of the temple and formed the pediment at the top. Where parts of the frieze were missing, for instance the parts that are on display in the British Museum, a copy was shown in raw plaster next to aged ivory colour of the original carving. 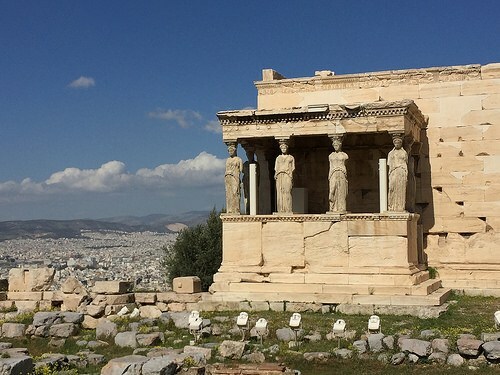 Most famous are the Caryatids that you’ll have seen at the Erechtheion on top of the Acropolis; this is where the real ones are kept to preserve them from the elements. They are also a favourite spot for visitors to have their photograph taken which is allowed in this part of the museum although not in all the galleries. On the second floor we watched a video in English about the history of the Acropolis which made it quite clear where they stand on the Elgin collection, now kept in the British Museum. 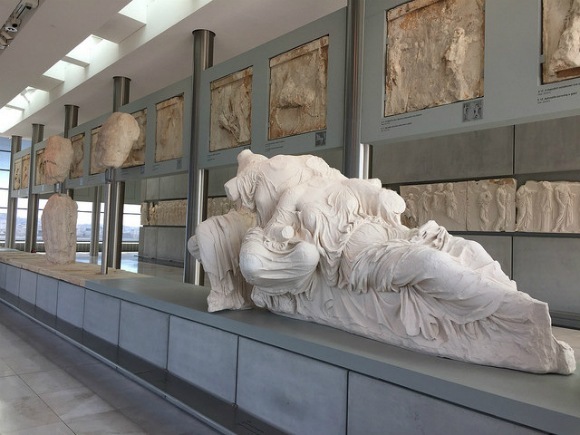 There is a long-standing campaign to have these artefacts from the Parthenon returned to the Acropolis museum which you can even vote on as you pass through Athens airport. We finished a very enjoyable visit to the Acropolis Museum with a drink on the sunny terrace cafe looking up at the Acropolis Hill above. 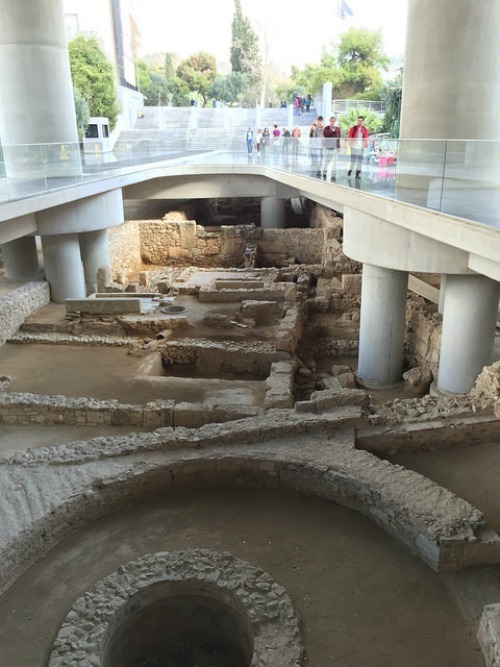 The museum is set at the foot of the Acropolis Hill next to Acropolis Metro station. On the top floor, watch the video in English about the history of the Acropolis. Photography for personal use is allowed in some but not all of the galleries. 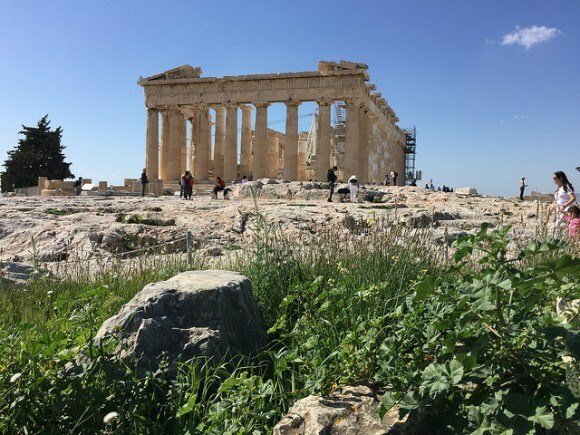 Around Athens there are plenty of other ancient sites and here are just a few that we enjoyed. Walking along the path from the Acropolis Museum leading toward Monastiraki you’ll see the Areopagus Hill, a rocky outcrop which has some wooden steps to allow you to climb to the top. From here you can get a great view of the Acropolis as well as over the whole city and it’s a favourite place to come at sunset as the city turns golden below you. 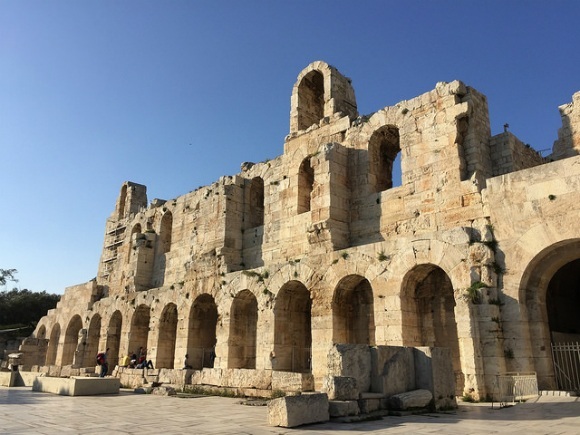 On the pedestrian route that leads past the museum up to the Acropolis you’ll pass the Odeon of Herodes Atticus, with solid stone arches through which you can glimpse the ancient theatre that was built in 161AD by a wealthy Athenian in memory of his wife. In summer the 5000 seat theatre is used for music, opera and concerts during the Athens festival that runs throughout the summer. 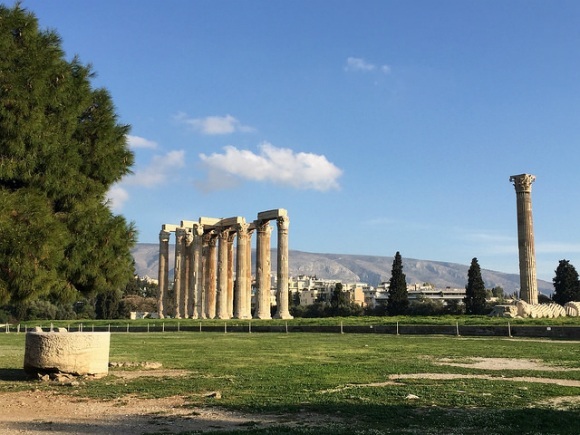 On one of our walks in the neighbourhood of our hotel we passed by the Temple of Olympian Zeus, set in a grassy park, although the gates were shut when we were there, so we had to content ourselves with a view through the railings. The temple was constructed over several centuries but fell out of use in the third century AD and the stones used for building elsewhere in the city. Today you can see a group of decorative Corinthian columns and the one that fell over in a storm, showing the round, carved sections like giant stone coins that made up the column. 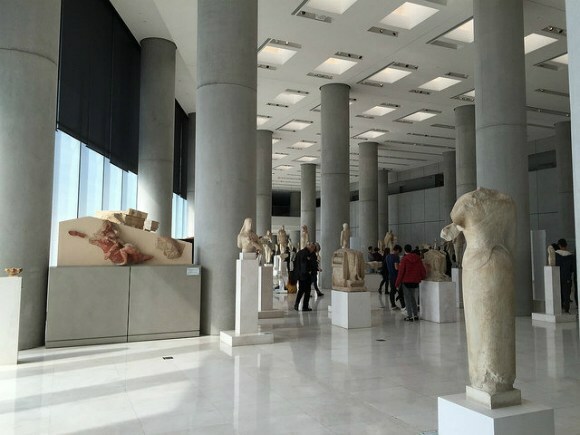 Have you visited the Acropolis or the Acropolis Museum and if so, what was your favourite part? 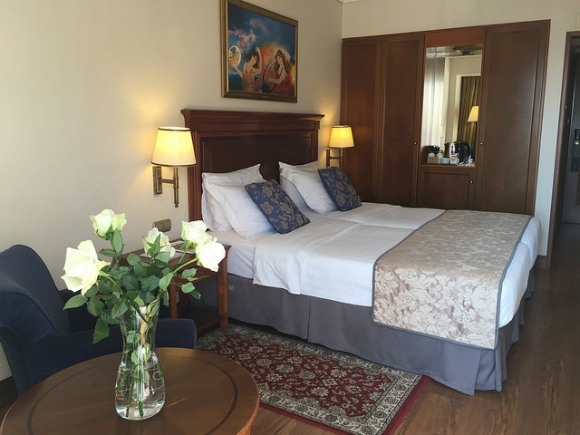 I highly recommend the 5 star Electra Palace Hotel where I stayed with my parents and sister while in Athens. This elegant, luxury hotel is in the Plaka district of Athens, at the foot of the Acropolis, and is well situated to walk easily to most of the ancient sites. The hotel is classic in decor and is a haven of calm to return to at the end of your day’s sightseeing. 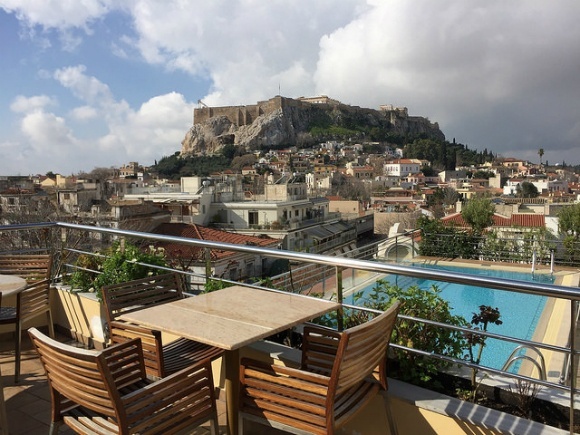 Even when not sightseeing, you’re never far from those prized Acropolis views, since there is a rooftop pool and bar to relax in the hotter months as well as a rooftop restaurant serving modern Greek cuisine where you can dine in the evening. 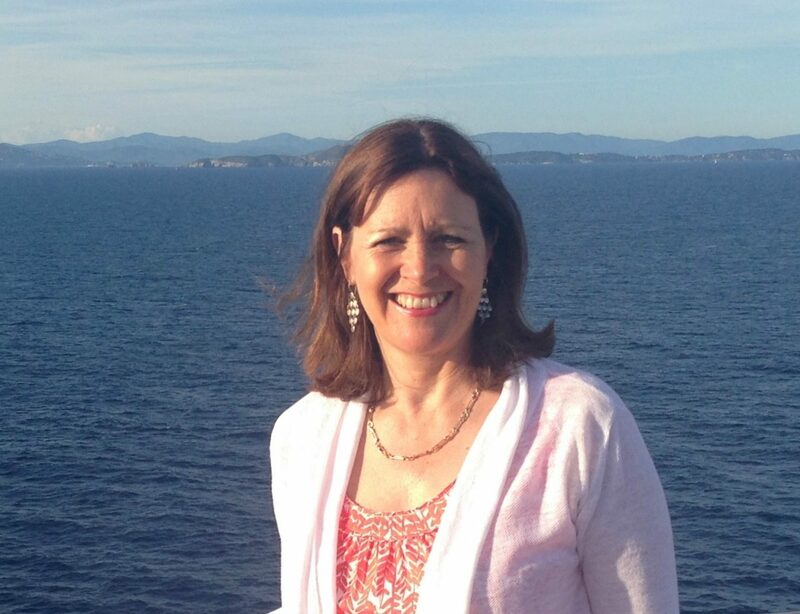 Thanks to the Electra Palace Hotel, Athens who hosted Heather’s stay at the hotel. Great post, Heather! I’ll be visiting Greece for the first time in November so I’ll definitely bookmark this. Love the video and photos too, thanks for sharing. Thank you Heather for the information! I’m going to the Athens with my husband and my 10 months old baby so wish me luck! @Rod I’m not sure about the official rules. If the rules say no tripod, I suspect you’d have to go with that although you could probably get away with something smaller like a gorilla pod that you rest on a wall. With video, I tend to use my iphone for video and never had any problem – I suspect that for personal use you would be fine with that or with a small video camera but generally they are probably trying to avoid commercial shoots without permission.